Vacation rental house. Sleeps 12, 3 bedrooms, 3 bathrooms. Dogs allowed. Cherrywood #21 is a 3 bedroom vacation dream home with 3 bathrooms, a loft, game room and sun room. 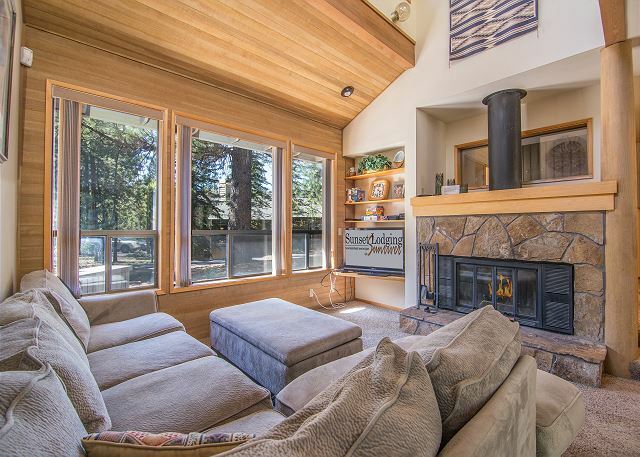 The living room has a fireplace with TV and comfy sofas to gather with loved ones. 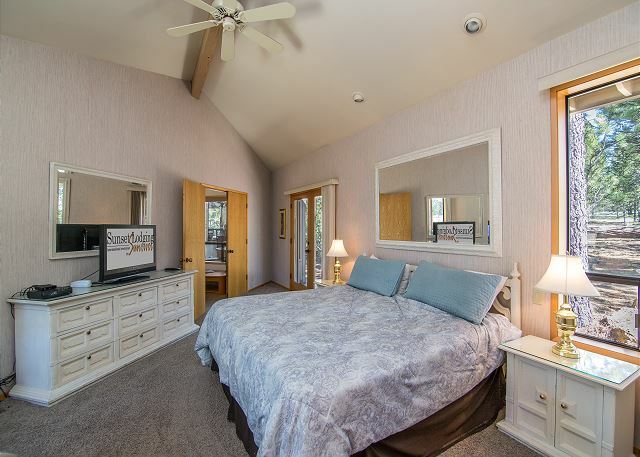 The master bedroom is adjacent to the living room equipped with a king bed and a Jacuzzi in the master bath. 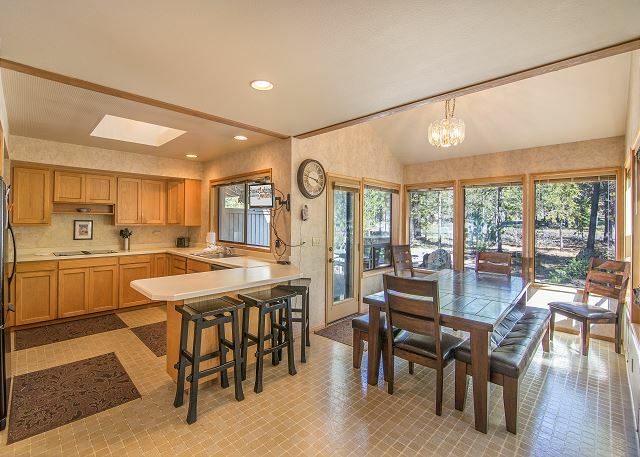 The dining area is situated next to the fully stocked kitchen and sun room. 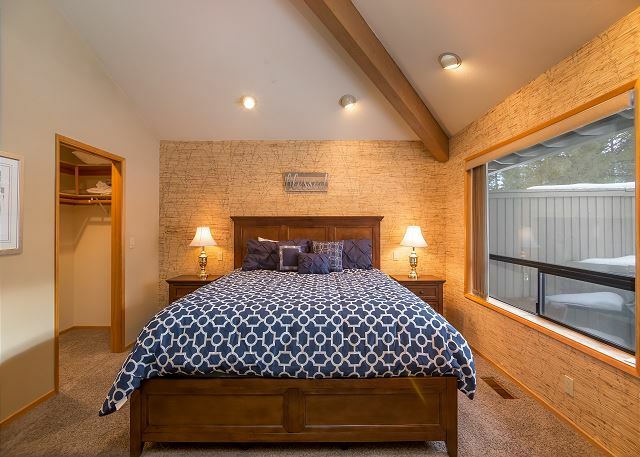 The 2nd bedroom with a queen bed is also on the main level. 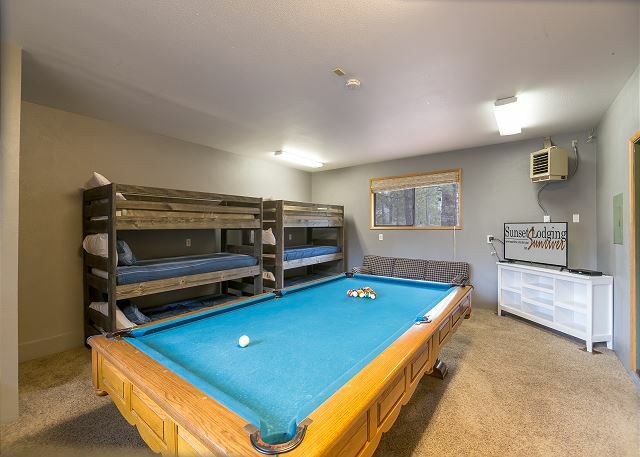 Make your way to the garage to enter the game room with 2 sets of bunks and a pool table...great area for kids and teens! 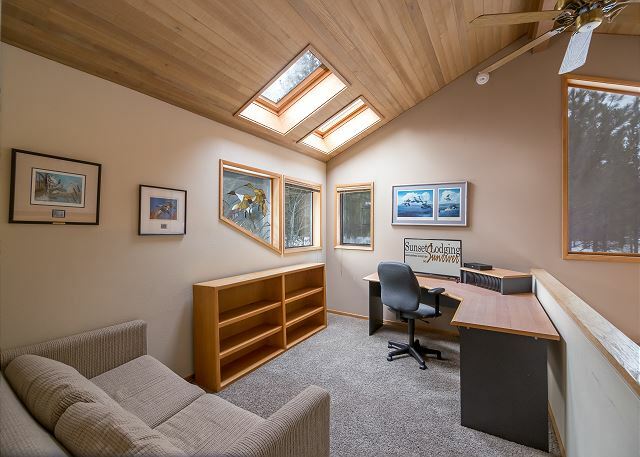 The loft area also has a desk for you to place your laptop and use the free high speed wireless internet access. 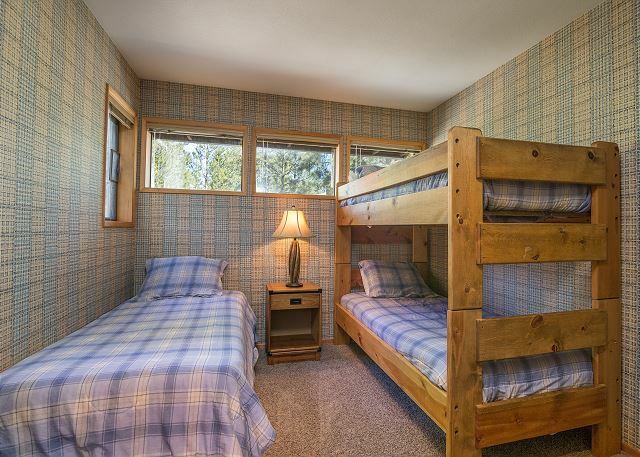 The 3rd bedroom is also upstairs with a twin bed and a set of bunks. This home comes with 8 Unlimited use passes to the SHARC facility, free Mt. Bachelor ski shuttle, free tennis and free access to the Sunriver Marina. Plus, discounts to local dining, shopping, recreation tours and much more! 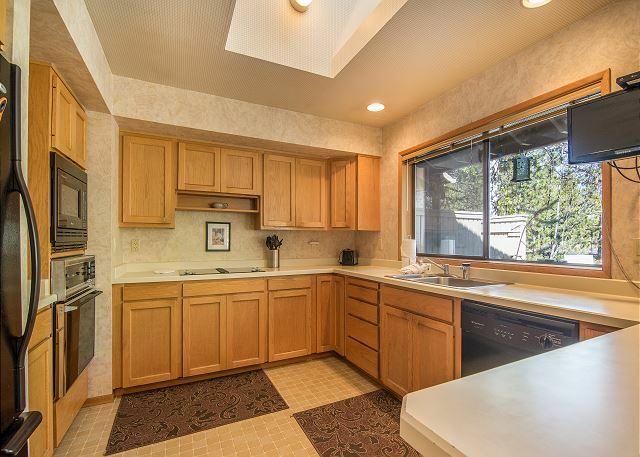 Enjoy the warm summers with this Air Conditioned home! Stayed here for my bachelor party and I was initially nervous about cars but there was a long driveway that we fit 5 cars into with no problem. You could probably max out at 6 cars. The house had a really fun layout with enough common space to gather everyone together. It was a squeeze but we fit all 12 people around the table too!. Super happy with this place. Blake, we are glad you enjoyed your stay and thank you for your review! We're glad we could help you celebrate your special weekend and hope to see you again in the future! We had a great time with our kids and grandkids as we celebrated our 50th anniversary. There was ample room for 6 adults and 6 kids. 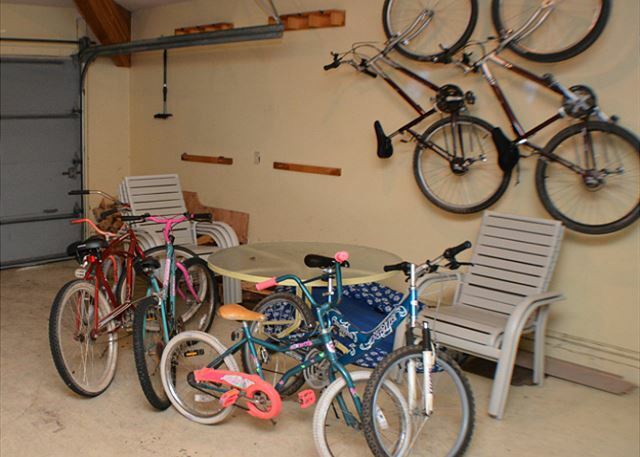 The kids loved the pool room, the SHARC, and the endless bike paths! The house is laid out well with a central dining and living area but bedrooms on different ends of the house. We ate most meals at the home and realized that there weren't 12 of every type of dish. Also benches around the dining room table need some reinforcing. Great spot but beware there is no AC - late afternoons and evenings were hot! Thank you for your review Edward! I will pass along your feedback on the matching dishes and the dining room bench. We agree this home is in a great location! Most homes in Sun River do not have A/C, however we will work on providing a few extra fans for this home. We hope to see you on your next trip to Sun river! 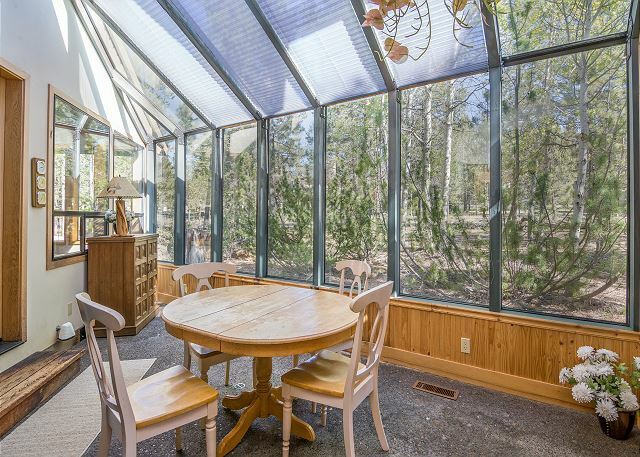 Everything about this vacation home is excellent. The only thing that made the stay less than perfect is that the weather was quit hot and there is no AC. Otherwise, everything was wonderful! 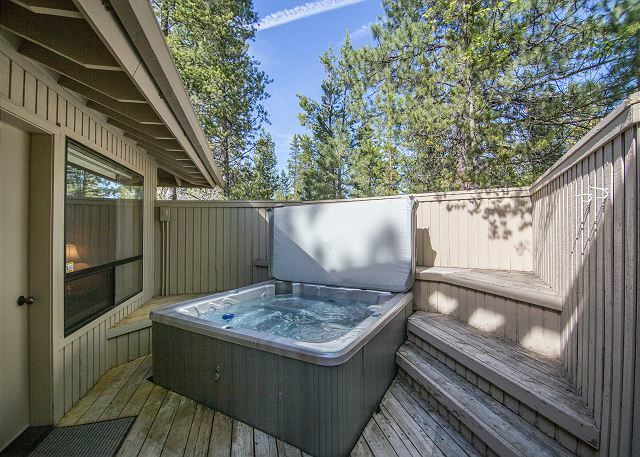 The SHARC passes, the available bikes, the pool table, the hot tub, and the quiet location make this an excellent choice to get away. The kitchen is well stocked with dishes, the washing machine and dryer also make this rental very comfortable. Hi Majorie! We are so thrilled that you enjoyed your stay in Cherrywood 21. It's a great home for sure! 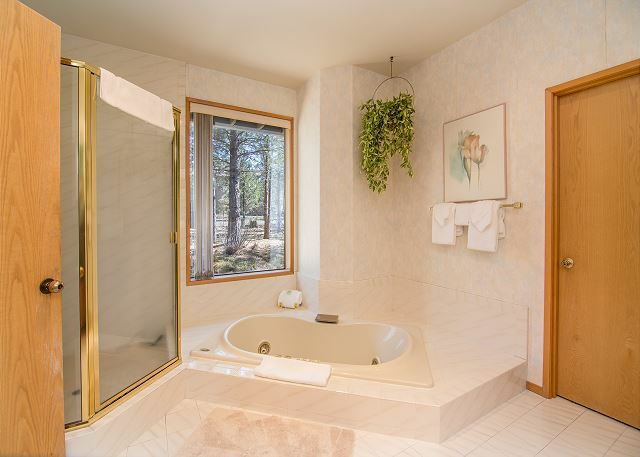 As far as A/C, the majority of homes in Sunriver unfortunately do NOT have it. Since Central Oregon is known for it's Hot days and cool nights, most of the time homes will stay cool during the day by opening windows all through the night and then closing first thing in the morning. We appreciate your feedback and hope you visit us again real soon! The property was great until the heating went out. Luckily there was a fireplace and a wood stove, and the management company was able to bring 2 space heaters. They fixed the heat after a couple of days. Otherwise, the house is very nice. Booking online was fine. Amenities of the house were not always in working order. Sorry that you experienced amenity problems, Julia. 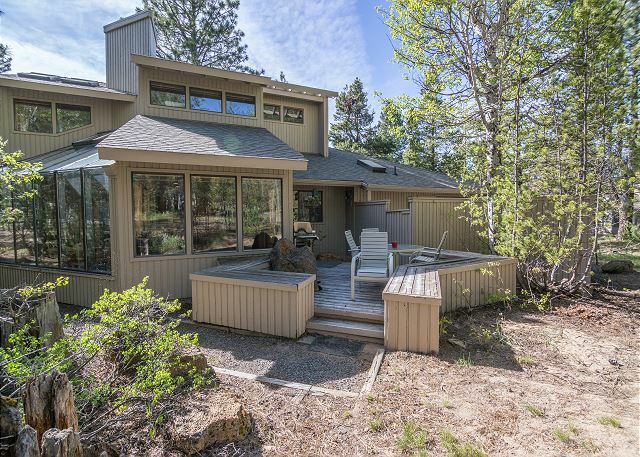 It's hard to respond with such a general review, but if you ever encounter ANYthing that is not up to your standards in our homes, please let us know right away and we'll show you why we have the best service ratings in Sunriver. We are ALWAYS happy to come out and fix/clean/reorganize/troubleshoot any problems you encounter as we don't want even one minute of your visit to be wasted. Thanks for your feedback. A very nice property, with plenty of space! This was a great layout for 2 adults and 4 children. (It could have even accommodated more). The jacuzzi tub, pool table, and indoor garden room were particularly enjoyed, and the SHARC passes were well used. Air conditioning would have been nice, altho' it was relatively comfortable considering the high temperatures. The number of TV's was appreciated, and the size of the dining room table very accommodating. We would recommend this property. This house had room to accommodate more than the 6 adults and 1 dog that we brought. It was very warm the first few days, and the AC couldn't keep up. The upstairs bedroom was like a sauna. Once the weather cooled down, we could open windows and it aired out nicely. Not sure how the heating would work in winter?? The beds were all comfortable. 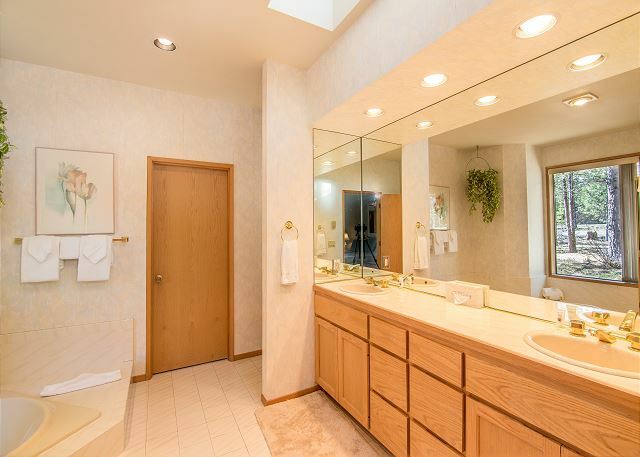 The master bathroom is enormous. Very quiet street and neighbors. Overall, had a great time. So glad you had a good visit at Cherrywood 21 Anita. We hope to get the privilege to host you year after year. We will look forward to your next visit! WE HAVE USED THIS CO.MANY TIMES AND WE WERE VERY HAPPY ONCE AGAIN. THE HOME WAS LOVELY AND IF THE WEATHER HAD COOPERATED,WE WOULD HAVE BEEN ABLE TO UTILIZE THE DECK SPACE ALSO. I WAS A BIT WORRIED THAT EVERYONE WOULD HAVE A PLACE TO SIT FOR THE MEALS BUT IT WORKED OUT WONDERFULLY. The home is very family friendly, for teens (pool table) and down to the toddlers (secret cubby hole room with kid size furniture was a favorite). Things were a little worn which is fine with kids, we didn't feel like we were walking on eggshells. One bike was broken and there were not enough helmets for the number of bikes but we rented some and the kids had fun biking. The internet fluctuated a lot so streaming movies didn't work well. Nice hot tub. No closet in the master where to hang a single hanger...that was inconvenient! Lots of off road parking. Several outdoor spots for quiet reading. We would love to rent here again. Thanks for this great feedback, Lucille! As a family run business, we are always delighted to hear that the home was a hit with the kids. 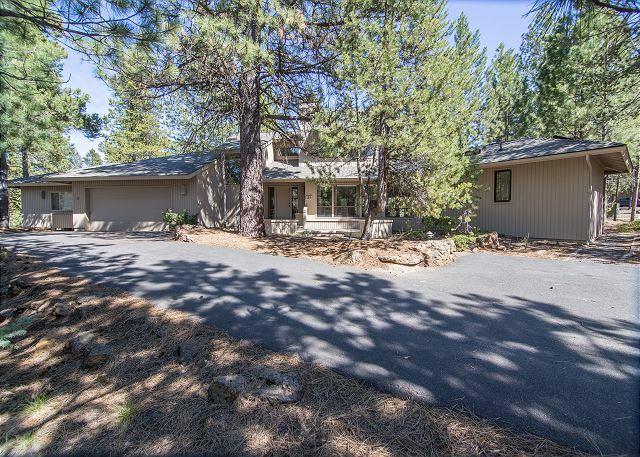 We want your family time in Sunriver to be cherished for generations. We hope to have the privilege to host the Edwards Family at Cherrywood 21 again soon! Cherrywood #21 was perfect for our group of 5 adults, 4 kids and 1 baby with 3 private bedrooms and 1 large game room for all the kids to stay in. 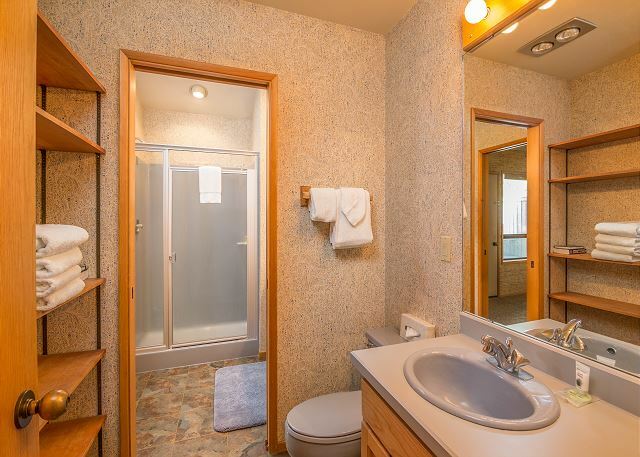 It was clean and equipped with everything we needed in the kitchen, plenty of towels in bathrooms, a TV in almost every room and lots of games, puzzles, bikes, and best of all the SHARC passes with admission to the North pool. Everything was in great condition and before we arrived the working staff promptly answered all our questions and provided information about the area. Cherrywood #21 was a great place to stay for our family vacation. We will be back. What a wonderful place to visit. My whole family had a great time.